When recording drums, you need a mix of microphones to capture professional results. You’ll need clip mics that work well on snares and rack toms; a mic designed for low-frequency sources like the kick drum; and overhead mics to capture room sounds and natural reverb. It is important that drum microphones have focused pick-up patterns to limit the bleed from other instruments, and have a high-SPL to eliminate internal clipping when the drummer plays with passion and attack. For miking the individual elements of a kit, the best mics are small and non-intrusive so the drummer does not feel limited when recording. These mics must also be rugged enough to withstand the inevitable collision with a drumstick. This drum microphone package from Sennheiser has all of the above and more for detailed drum miking. 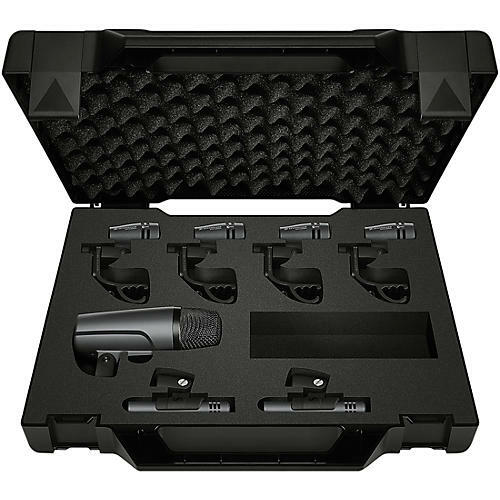 It comes with 2 Sennheiser e 614 Overhead Condenser Microphones; 4 Sennheiser e 604 Dynamic Cardioid Instrument mics for snares and toms; and 1 Sennheiser e 602 II Cardioid Instrument Microphone for the kick drum. The Sennheiser e 614 is a supercardioid back-electret condenser microphone. The e 614 mic was designed for demanding instrument recordings that require extended frequency response, high SPL, fast transient response and compact mic size. While percussion pick-up was the first design priority, the e 614 also works exceptionally well on woodwind and string instruments, and is a good choice for flute and sax where it captures the full body of the instrument. The e614 can handle high SPLs and features a medium sensitivity, which ensures reduced bleed from other instruments onstage. Because of its excellent acoustic properties this mic is also ideal for home recording. The response and cardioid pattern of the Sennheiser e 604 Drum Microphone is optimized for use on drum sets, while also producing exceptional results on brass and woodwinds. Sennheiser e 604 mics handle very high SPLs, with clear, balanced, low-distortion signals similar to high-end studio condenser mics. Lightweight voice coils provide extended high frequency and rapid transient response. Tough reinforced fiberglass bodies take knocks and shocks and suppress impact noise. The Sennheiser e 602 II is a cardioid instrument microphone especially suitable for use with bass drums, bass guitar cabinets, tubas, and other low-frequency instruments.